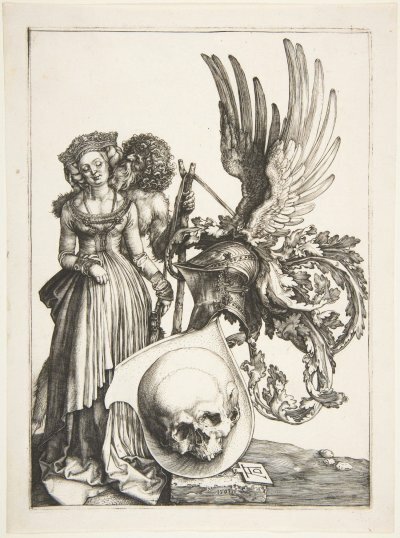 " In this stunning engraving, Dürer recast the theme of memento mori in a brilliantly unusual form. The woman in patrician dress is identified by her crown as a bride, but the person who embraces her from behind is a wild man. This traditional figure from German folklore is often present at weddings, but his shield, invisible to the young woman, reveals him to be a surrogate of Death. The angle of the skull on the shield is exactly that of the young woman's head. "